In late June, Boston 2024’s boosters unveiled a revised Olympic bid that they deemed “a winning plan for Boston.” But the revision fails to address many of the bid’s deficiencies unearthed over the last six months: optimistic revenue projections, lowballed cost estimates, thin margins, unwanted and unneeded venues, and only vague, nebulous promises about how taxpayers will be protected from financial risk. Boston 2024 could have dispelled some of these concerns by explicitly rejecting the International Olympic Committee’s request for a guarantee that host cities accept responsibility for Olympic deficits — the so-called blank check. The bid committee’s refusal to do so reveals just how little negotiating leverage it has in the IOC’s Olympic auction process. Up against bidders from Paris, Rome, Hamburg, and Budapest, some of whom will have the financial backing of their national governments, Boston 2024 must agree to the exacting and costly demands the IOC makes, even when those demands run counter to the best interests of the Commonwealth. The revised bid still proposes constructing a stadium, an aquatics center, and a velodrome — all from scratch, and all at taxpayer risk — as well as pledging that a network of travel lanes on state highways be dedicated exclusively to IOC VIPs, athletes, and corporate sponsors. Insurance is not going to protect taxpayers from Olympic deficits. Boston 2024 admits that insurers will never cover changes in scope or overly rosy cost projections. 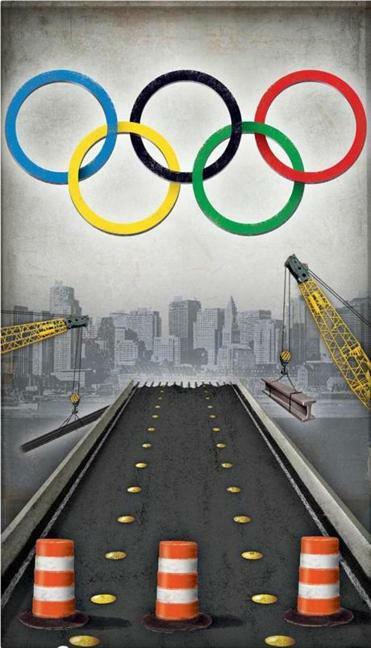 Not coincidentally, these are the two major drivers of cost overruns, which have plagued every Olympics since 1960. The bid’s risk is only magnified by a scheme to build a massive $800 million deck over active rail lines at and adjacent to Widett Circle. The deck would have immense uncertainty and complexity as a stand-alone project. Joining it to the IOC’s process dramatically and unnecessarily tightens the timeline, and puts the risk of the project squarely on the shoulders of the public. To compensate an unidentified master developer for construction of Boston 2024’s Big Deck, the boosters are seeking the most lucrative tax credits in the history of the City of Boston — credits that wouldn’t expire until 40 years after Olympic construction broke ground. After more than two years of asserting that Boston 2024 would spur needed transportation improvements, the boosters chose not to allocate a single dollar of their $4.5 billion operating budget to fund the MBTA. They offer a wish list of system enhancements they would like to see funded publicly, but they are not proposing new transportation revenues to cover those costs. They are not growing the transportation pie, just cutting a bigger slice for the projects that suit their priorities. Temporary stadiums and velodromes are not the key to a brighter economic future. Instead, we should be focusing our public resources and civic attention on what has always made Massachusetts great: our people. That means helping residents acquire skills through top-notch schools and worker training, keeping them healthy with high-quality health care delivered at a reasonable cost, fostering a better business climate to unleash their entrepreneurial spirit, reforming backward zoning to bring down the costs of their housing, and reducing transportation bottlenecks that harm their productivity. Now that would be a winning plan for Boston, and for our entire Commonwealth. Let’s embrace a future that elevates the needs of our own residents, not subjugates them to the desires of Boston 2024’s boosters and the International Olympic Committee. 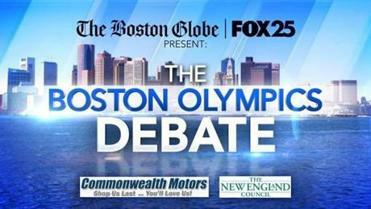 Kelley Gossett and Chris Dempsey are cochairs of No Boston Olympics.